We’ve just added a new permanent page on this website, where we’ll collect all the praise & press we can find for Once Upon a Time Machine in one place. If you’d like to indulge us in our vanity, go check it out! And remember, we’d love to hear your thoughts on the book, too! Let us know what you took away from it on Twitter, Facebook, Goodreads or Amazon! Editor Andrew Carl chatted with the fine folks at About.com about how the wonderful animated trailer for Once Upon a Time Machine came together, as part of their series of advice on how to market one’s book online. The OUaTM trailer was also featured and discussed briefly in this more general About.com article, Tips to Producing An Effective Online Book Trailer. Let’s enjoy that trailer again, shall we? Animation, of course, by the fantastic Lance Erlick. Recently, Once Upon a Time Machine editor Andrew Carl and producer Chris Stevens (virtually) sat down with the folks at Diamond Bookshelf for a little interview. We discussed the origins of the book, the creative vision that drove it, and our theories as to what makes fairy tales so enduringly popular and beloved. Even better, Diamond Bookshelf took the opportunity to share a few never-before-seen finished pages from the book. 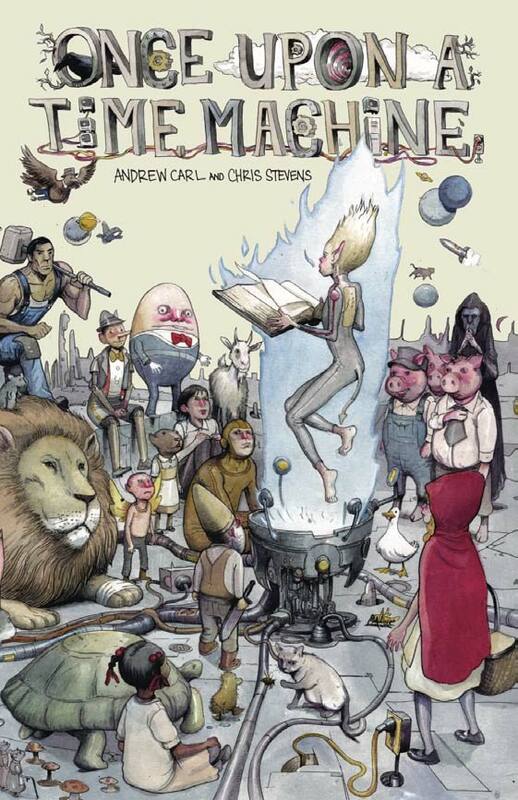 And of course, Farel Dalrymple’s cover (it never gets old). And let us know what you think, right here or on Facebook! Q: Tell us a little about your life as an artist, and how you got to where you are today. Since I was a kid I had always been pretty obsessed with cartoons and then eventually comic books. Around first or second grade, working in one of those fields became my dream job – replacing becoming a Ghostbuster (still time for that, though, right?). I’m still struggling to make a living from it; I had a few “almost there” moments where I did get some work for DC Comics Creative Services department, but the editor I was working with got canned like 3 months after I started there, so all my worked dried up because I didn’t know anyone else at DC. 😦 Ever since then I’ve been taking on odds and ends until something a bit more stable comes along, all while trying to finish some creator-owned projects. I didn’t go to college for art, so I’ve picked everything up on my own and by picking other people’s brains (not literally, that would be gross…or tasty), like how I learned Photoshop from my more computer-savvy younger brother. If I had gone to college, I’d be really screwed with having to pay off student loans right about now. So I’m thankful for that, heh. Q: I see three sorts of comic work under your belt: work-for-hire, collaborative, and personal. How do you compare the three?